New large hydro has shown a major year-to-year slowdown in 2016. It has also shown opposite tendencies for pumped storage and “true” hydro. systems, in particular balancing variable renewables such as wind and solar. Although some pumped storage projects, like Kanevskaya in Ukraine, are planned in sensitive and inappropriate areas, an average PSHPP is much less destructive than “true” large dam HPP. This statistics leaves only 25 GW for “true hydro” (predominantly large dams), which is significant decrease from 31GW in 2015 and 37GW in 2014. 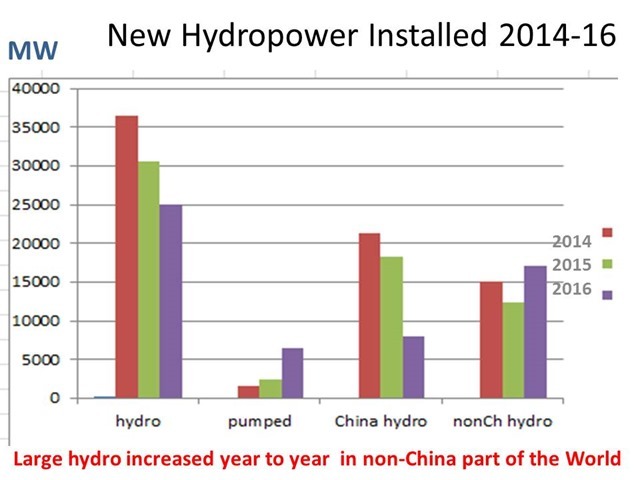 The decrease is driven solely by steady decline in “true” hydro installation in China, where “only” 8GW of hydro were inaugurated along with 3.7GW of pumped storage. However the rest of the world slightly increased “true” hydropower installation compared to previous two years which was caused by Brazil launching 6 GW (primarily Jirau Hydro) and Ethiopia inaugurating Gibe III Hydro on Omo River that will soon cause degradation of the Lake Turkana Parks World Heritage Site in adjacent Kenya. standards and are compatible with the goals of the Paris Agreement”. This would allow developers access to the growing green bond market. In June 2016, the Climate Bonds Initiative launched a working group to develop criteria for the screening of climate-compatible hydropower, expected later this year. Greenwashing of hydropower and access to climate funds are central topics discussed in the IHA brief. The IHA Annual Congress will take place in Ethiopia in April 2016.